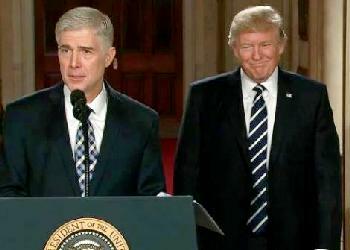 WASHINGTON, DC, February 1, 2017 (ENS) – Neil McGill Gorsuch, a judge who now sits on the Tenth Circuit Court of Appeals in Denver, Colorado, is President Donald Trump’s nominee for the seat on the U.S. Supreme Court left open by the death of Justice Antonin Scalia on February 13, 2016. If confirmed, the jury is still out on what he would mean for the environment. 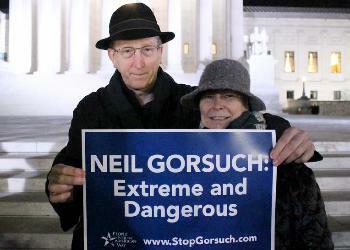 Gorsuch is the son of David Gorsuch and Anne Gorsuch Burford, a Republican and states’ rights proponent. Under President Ronald Reagan, his mother was the first female head of the U.S. Environmental Protection Agency. He was born in Denver, Colorado in 1967, but moved to Washington, DC as a teenager, after his mother was appointed to head the EPA. Gorsuch received a B.A. from Columbia University, a law degree from Harvard and a PhD in Legal Philosophy from the University of Oxford in the UK. 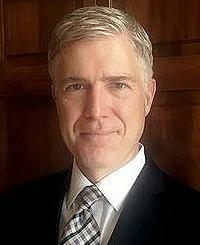 Gorsuch clerked for Judge David Sentelle on the U.S. Court of Appeals for the DC Circuit from 1991 to 1992, and then for U.S. Supreme Court Justices Byron White and Anthony Kennedy from 1993 to 1994. From 1995 to 2005, Gorsuch was a lawyer at the Washington, DC law firm of Kellogg, Huber, Hansen, Todd, Evans & Figel. He served as principal deputy to the Associate Attorney General Robert McCallum at the U.S. Department of Justice from 2005 until 2006. In May 2006, Gorsuch was nominated by President George W. Bush to his present seat on the U.S. Court of Appeals for the Tenth Circuit. In 2002, Gorsuch wrote an op-ed criticizing the Senate for delaying the nominations of Merrick Garland and John Roberts to the U.S. Court of Appeals for the DC Circuit, writing that “the most impressive judicial nominees are grossly mistreated” by the Senate. Roberts is now Chief Justice of the United States. Gorsuch’s Supreme Court nomination comes at the expense of Judge Garland, who was nominated for the same seat by President Barack Obama soon after Justice Scalia’s death but was denied a hearing and a vote by the Senate. Senate Republicans said that because it was a presidential election year, they would hold the seat open until a new president came into office, a first in American history. “This is the first time in American history that one party has blockaded a nominee for almost a year in order to deliver a seat to a President of their own party. If this tactic is rewarded rather than resisted, it will set a dangerous new precedent in American governance,” Merkeley warned. “This is a stolen seat being filled by an illegitimate and extreme nominee, and I will do everything in my power to stand up against this assault on the Court,” he declared. Senate Majority Leader Mitch McConnell, a Kentucky Republican, today expressed the opposite view. “We know that Justice Scalia’s seat on the court does not belong to any president or any political party. It belongs to the American people. When it became vacant in the middle of a contentious presidential election, we followed the rule set down by Vice President Joe Biden and Democratic Leader Senator Schumer, which says that Supreme Court vacancies arising in the midst of a presidential election should not be considered until the campaign ends,” said McConnell. Judge Gorsuch has ruled on a limited number of environmental, energy, and natural resources cases, writes Denise Grab, a senior attorney at the Institute for Policy Integrity at New York University School of Law. “Given his reluctance to engage on the merits in these cases when they can be avoided on procedural grounds, it seems as though he is unlikely to be viewed as a champion of environmental protection by advocacy groups,” she writes in an analysis of Gorsuch’s environmental rulings. “However,” writes Grab, “a number of his rulings suggest that he may take positions that could be consistent with environmental protection, depending on which governmental actors are instituting environmental rules and how they go about doing so. “A review of Gorsuch’s writings and decisions indicate that he would seek to overturn well-established Supreme Court precedents and prevent the federal government from enforcing bedrock environmental laws such as the Clean Air Act and Clean Water Act,” wrote Van Noppen today. “Gorsuch’s record suggests he would take the court in a far-right direction doing irreparable harm to the health of communities, while failing to protecting wildlife, our public lands and restricting efforts to combat climate change,” Van Noppen wrote. The 10th Circuit tends to see fewer environmental cases than other circuits, but it does see public lands cases due to the vast stretches of federally managed lands in the Mountain West. “From the limited number of cases that Judge Gorsuch has ruled on, we can make projections about how he might rule on environmentally related cases in the future,” writes Grab. Judge Gorsuch recently came out strongly against Chevron deference to agencies in the 2016 Gutierrez-Brizuela v. Lynch case. Chevron deference is a principle of administrative law requiring courts to defer to interpretations of laws made by those government agencies charged with enforcing them, unless such interpretations are unreasonable. EPA has relied on Chevron deference heavily since it was decided in 1984. Originally, Chevron was viewed as an anti-environmental ruling, but more recently, EPA has frequently relied on it to support its stricter environmental regulations. Chevron deference has recently come under fire from conservative groups that would prefer less environmental regulation. In his 2010 United States v. Magnesium Corp. decision, Judge Gorsuch held that EPA was permitted to change its interpretation of an ambiguous Resource Conservation and Recovery Act regulation without undertaking notice and comment rulemaking, showing deference to the agency in its interpretation of its own regulations. This case suggests, writes Grab, that Judge Gorsuch may be comfortable with an agency changing its mind on earlier interpretations, which could become relevant if EPA and other agencies change their policies going forward under the Trump administration. Grab points to the unpublished 2015 Backcountry Hunters and Anglers v. U.S. Forest Service case, as perhaps of most concern to environmental plaintiffs. In this case, Judge Gorsuch required an unusually high bar to establish standing. In this case, Judge Gorsuch found that the plaintiff outdoor advocacy group lacked standing because if the order they challenged as being too lenient was struck down, the agency would revert to an earlier, even less-strict version of the order, and so the organization’s conservation goal would not be advanced. “Judge Gorsuch’s opinions involve several other examples of applying procedural bars to reaching the merits in public lands/environmental cases,” writes Grab. Another key environmental issue is the relationship between federal and state law, particularly in cases where a state government wants to institute stronger environmental protections than the federal government. Judge Gorsuch has a mixed record in his rulings on how federal and state law should interact in these and related cases. Judge Gorsuch has been an opponent of the dormant commerce clause, a legal doctrine that courts in the United States have inferred from the Commerce Clause in Article I of the United States Constitution. It allows state laws to be declared unconstitutional if they too greatly burden interstate commerce. In his opinion for the 2015 case of Energy and Environmental Legal Institute v. Joshua Epel, Gorsuch opined that Colorado’s mandates for renewable energy did not violate the commerce clause by putting out-of-state coal companies at a disadvantage. He held that the dormant commerce clause did not preclude Colorado from enacting its renewable energy mandate. Judge Gorsuch has also ruled on cases involving federal statutory preemption of state tort law, that is the law dealing with civil wrongs, rather than criminal actions. Grab explains that Judge Gorsuch’s rulings in these cases tend to “hew closely to the statutory text…” Sometimes Gorsuch has found that the statute blocks a state law claim, such as in the 2015 Caplinger v. Medtronic case involving a product liability claim for a medical device. Yet, sometimes he has ruled that the state claim may proceed, as in the 2015 Cook v. Rockwell International Corp. case, involving contamination at a nuclear weapons plant, where the plant operators forfeited their argument that Price–Anderson Act expressly preempted state tort claims.